This is the second post in a not-quite series about nurturing my kids’ talents and encouraging their interests. Read the first post here. My son will do anything Titanic-related, so I grabbed this puzzle when I saw it on Amazon. It’s a tough one (deep waters, starry sky) and in the many hours we’ve spent working on this thing he’s never stopped reeling off Titanic facts. He doesn’t need to know the history of the Titanic to succeed in life, but he does need to know how to concentrate, absorb facts, and dive deeply into a subject. He’s getting it down. 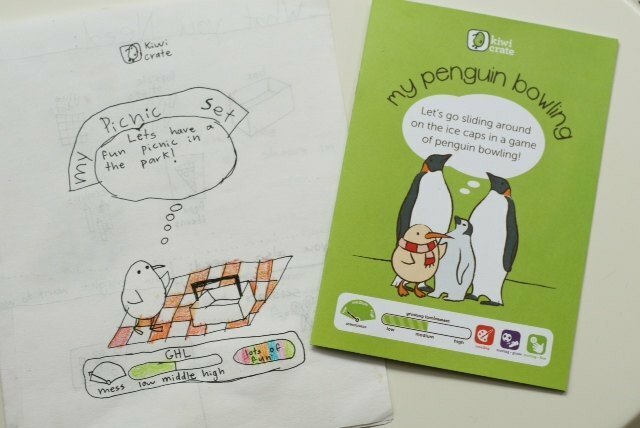 I have at least one budding author in my house, but I want all my kids to develop good writing skills so we’re making it easy. We stock paper and pens (good ones, just like Mom and Dad’s) and notebooks, of course, but we also keep a basket of notecards handy. It’s great writing practice, but it feels like it’s just for fun. Plus, what kid doesn’t love getting mail? Win/win/win. I still feel like a novice. I am still a novice. My oldest child is only 10. But so far, this general approach is working for us. We’re at the intersection of deliberate and hands-off, of structure and freedom, and so far it’s suiting everyone’s personality, big or small. 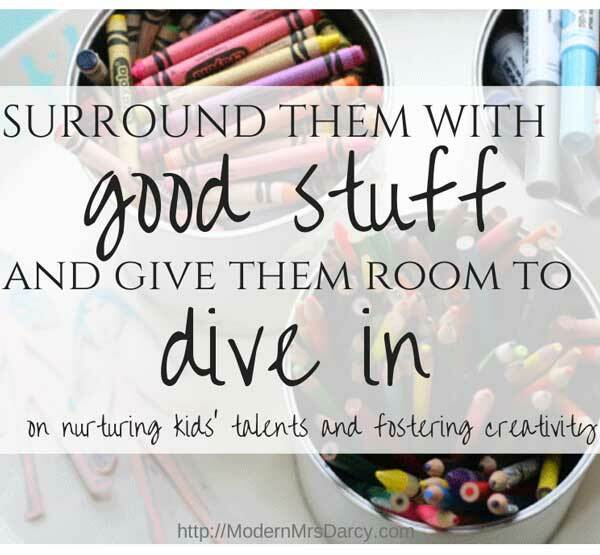 I’d love to hear what you do to nurture your kids’ talents and encourage their interests. Share tips/philosophies/rambling musings in comments. I love this and your intentionality in this area is very inspiring. I am working this idea, a lot. We keeps books, crayons, puzzles and toys in the house and we make weekly trips to the library as well. For us, I really worry about my kids still being too obsessed with watching TV, even though I say no so much more than I say yes. We don’t have cable and they really only ever watch it while I’m making breakfast or dinner but still they ask for TV or iPad more than anything else. And it makes me feel gross. They do love to read as well, although they can’t do so on their own, we made two literary related trips yesterday. Overall I really need to learn how to teach them to entertain themselves, because it feels like we either have to put on TV, entertain them directly or take them somewhere in order for things to go smoothly. Free play that works is rare and this bugs me. I’m sure you’ll have a good recommendation for this….? Yes? Why as a matter of fact, I do have a good recommendation. 🙂 Give it a year? Or two? There is a huge difference between having kids ages 2 and 4 and two kids ages 3 and 5. HUGE. That, and the timing. Free play doesn’t work for us (especially the boys) when they are itching to move. They do much better after they’ve spent some time on the swings. I love these ideas, Anne. We are in transition mode at the moment, with a major move looming on the less than 4-week horizon, but I am still trying to keep the office supplies and books available to my kids. They LOVE pens, paper, envelopes, post-its, outdated letterhead, and any other office supplies that my husband and I may have on hand. I try to set up an “office” for them every couple of days at the dining room table. They love illustrating and writing, and my daughter often wants to “grade” my students’ papers alongside me. My son is also obsessed with ALL THINGS Titanic. I love that your daughter wants to grade papers with you! That is precious. Yes, I try to do this too. In fact the thing my kids have used most this year is an old tin tea container that I filled with freshly sharpened pencils and left without comment on my son’s shelf. They are always making drawings, notes and lists now (well, they are 2 & 5 so maybe that should be in quotes). This is going to sound totally whacko, but what kind of pencils do you use? 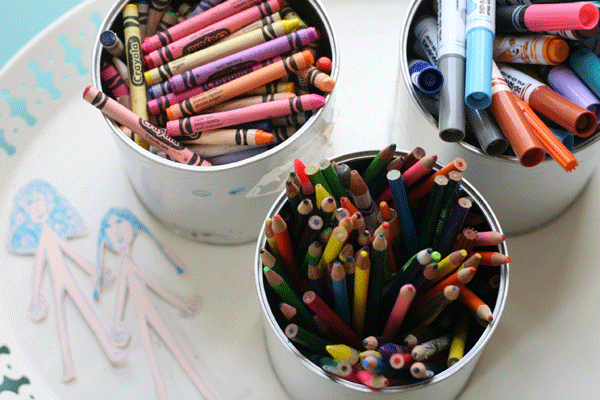 It’s embarrassing how pencils have become such a stumbling block in our homeschool. I’m still searching for ones that don’t break or have the lead fall out when we sharpen them. American naturals available at Target. They’re the plain wood ones. Love this post. I realized that I have been doing this sort of, without really thinking about it. I need to be a bit more intentional about it…really thinking about their interests, and deliberately supplying things to aid in their pursuit of that interest. I also struggle with a really tiny house that has little space for storage and especially for having things out and “at the ready” whenever the mood strikes them. Not sure what to do about this one. I also need to say that I LOVED your post yesterday. I needed that. I may even print it out for me to read frequently. Thank you. Thank you. Thank you. I thought it was just me. Thank you for illuminating what is really going on when I feel drained with the incessant talking from my kids. We live in a small house, too. It doesn’t feel small because we have storage space and a big backyard, but it was a gamechanger when I finally realized that we have the same square footage as we would if we lived in a tiny NYC apartment. Urban apartment dwellers have to be really smart about how much “stuff” they keep and how they store it….and so do I. It seemed obvious in hindsight but it really changed my approach to organizing. Anne, I’m not a Mom and I don’t know a thing about homeschooling, but I loved this post and think you’re such a cool Mom. You’re doing a great job! I feel so much better hearing your son loves the Titanic too! My 8 year old caught the bug last year during the 100 year anniversary, and my 5 year old got into it too. I really worried about it for awhile, just dealing with the death and sadness. But they seem much more interested in the actual ship than the loss of life. We visited one of the musems, watched lots of documentaries, and they still build Titanics (and her sister ships) out of legos. They make ‘oceans’ in the driveway, and sail sticks for the boat too. Angie, I had the same reaction at first! But my son sounds like your boys–he’s interested in the ship; the whole heartbreaking story is just details. 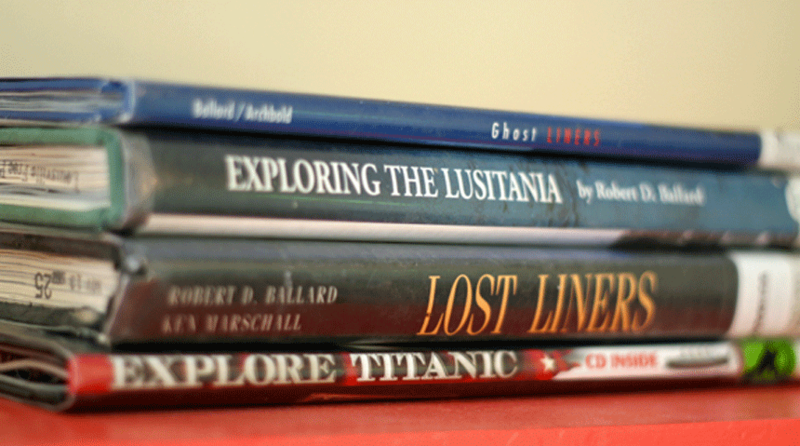 We just stumbled upon a Robert Ballard documentary we hadn’t seen yet at the library tonight–that’s on tomorrow’s agenda. I love that they’re turning your driveway into an ocean! In the kitchen my mom set aside one floor level cabinet which was packed full of paints, paper, clay, pens, paper, popsicle sticks, glue, felt, pipe cleaners, stamps, ink, glitter, and tons of other crafty goodness. I loved being in the kitchen, so it got opened frequently! The one rule was that I had to put everything back into the cabinet when I was done. Additionally to that, every Tuesday we’d order a pizza, walk to the public library and check out a STACK of books while returning last weeks, and have pizza and applesauce for dinner. I got read to every night, 3 whole books! My first kid is 12 weeks on the way and I can’t wait to carry on these two very important family traditions! I’m working on my PhD in Biotechnology; the skills of being able to concentrate for long periods of time, be independent and creative, and intense love of reading, I without a doubt attribute to my mom’s fostering of independence and responsibility at a young age. Anne, you are such an enabler. And what a blessing to your kids that you are! The part of our house that is supposed to be the formal living room is our playroom, where all the puzzles and games and boxes of toys are kept. It is the first thing anyone walking in the front door will see. Good thing our friends don’t care if our house is a showcase for fine furniture or not! Even though our kids are 20 and 22 now, that room has stayed the same. It came in handy when we had four little overnight guests, siblings 3, 5, 8 and 11 years old, staying with us last Monday night. 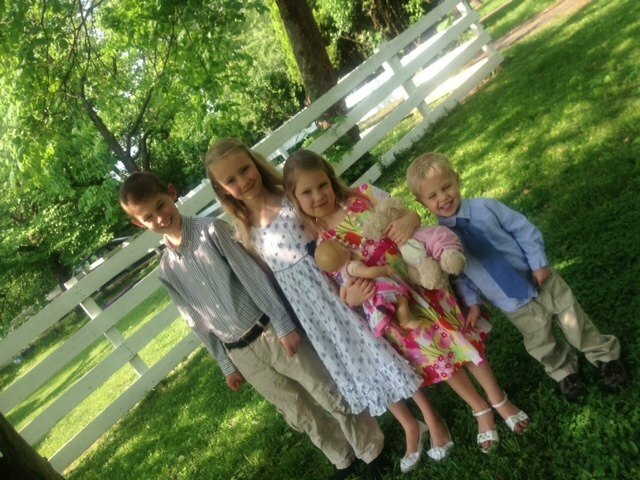 It was a special treat for us because these were Messionary Me’s four kids! I’m big on this, Anne. Here’s a few more ideas. Yours are great. 1. Huge chuck of natural clay in plastic storage bin on the back patio. We use wooden sculpting tools. My kids love to create bowls, figure, pies, & Native American villages with the addition of twigs and grass. The whole thing can be hosed off when they’re finished. 2. Bricks, boards, wooden pallets. (It helps that my husband is a masonry contractor — we always have this stuff behind our shed.) My kids build their own bridges, forts, obstacle courses, etc. 3. Reusable recyclables on a shelf in the basement. Shoe boxes, coffee cans, clementine crates, etc. My kids each have their own roll of duct tape. Last week they created a card board castle and soon I’m going to let them paint it. 4. Basket of rhythm instruments. They usually get these out when my husband plays the guitar at night during family devotions. Good list, Adriana. I’d add something that always seems to be on sale at Target: sidewalk chalk. Kids can sit for a long time drawing on the driveway, and it’s fun to get down on the ground with them and contribute to their drawings. Anne, I love what you said about surround them with good stuff and give them time and space to dive in isn’t a bad approach for grown-ups, either. I know that it only takes me like 10 minutes to go onto my library website and put books on reserve. But it makes such a huge difference if I take the time to do that. I am such a happier camper when I have a stack of amazing books to get through!! Of course, I’m supper influenced by my environment, so a clean kitchen, a yoga mat I can get to and have space to roll out, and even a clean desktop on my computer are all key parts in helping me steward my time. Your house seems like it is just dripping with fun things to do and read! I’ll make sure and tell my kids you said that: we’re pretty well stocked, but they love visiting friends’ houses to check out other people’s stuff! What a great, inspirational post. Your kids are blessed, Anne! This is exactly what I want for my home. My oldest is only 5.5; so, we are still pretty unschool-y for now, but we’ll be adding more structure soon. 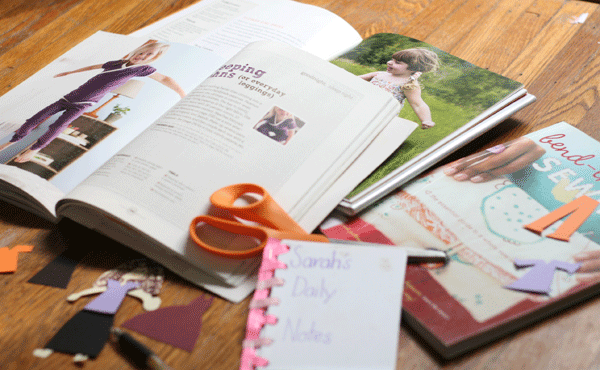 Loved the paper dolls and Sarah’s Daily Notes. Precious. I don’t have kids, but I was a kid in an environment like this. My mom homeschooled us (which I almost never say out loud, because people start to look at me as though I’ve sprouted horns). When people seriously ask, this is what I tell them: we had time to get interested in something and pursue it. If we were learning about caves and we got really into it, we could spend a bit more time. I am convinced that this is the reason that I read and engage so widely with life today. I learned how. Cara, THANK YOU for that. That’s exactly what I’m hoping for, and it’s so reassuring to hear from parents who’ve parented through that stage and kids who’ve grown up in a similar environment. 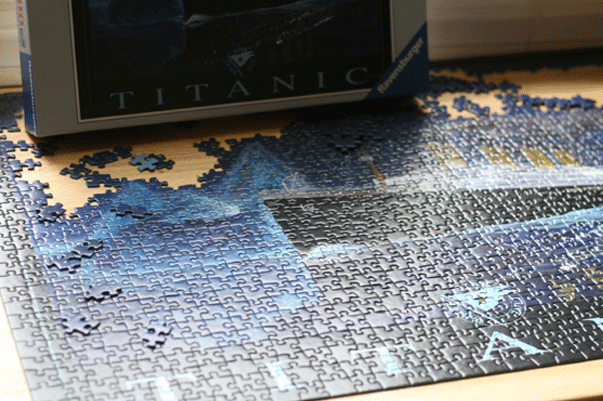 Btw, that Titanic puzzle is impressive. We need some help on the Titanic’s starry sky. It’s tough! Pingback: "All the world's parenting advice can be distilled to two simple rules." Pingback: Maybe kids' extracurriculars aren't so bad after all.